StackStorm has been systematically built with High availability(HA) as a goal. The exact deployment steps to achieve HA depend on the specifics of the infrastructure in which StackStorm is deployed. This guide covers a brief explanation on various StackStorm services, how they interact and the external services necessary for StackStorm to function. Note that StackStorm components also scale horizontally thus increasing the system throughput while achieving higher availability. A reproducible blueprint of StackStorm HA cluster is available as a code based on Docker and Kubernetes, see StackStorm HA Cluster in Kubernetes - BETA. It is possible to run st2sensorcontainer in HA mode by running one process on each compute instance. Each sensor node needs to be provided with proper partition information to share work with other sensor nodes so that the same sensor does not run on different nodes. See Partitioning Sensors for information on how to partition sensors. Currently st2sensorcontainer processes do not form a cluster and distribute work or take over new work if some nodes in the cluster disappear. It is possible for a sensor itself to be implemented with HA in mind so that the same sensor can be deployed on multiple nodes with the sensor managing active-active or active-passive. Providing some platform level HA support for sensors is likely to be an enhancement to StackStorm in future releases. In HA deployments, external monitoring needs to setup and a new st2timersengine process needs to be spun up to address failover. Losing the st2timersengine will mean no timer events will be injected into StackStorm and therefore no timer rules would be evaluated. 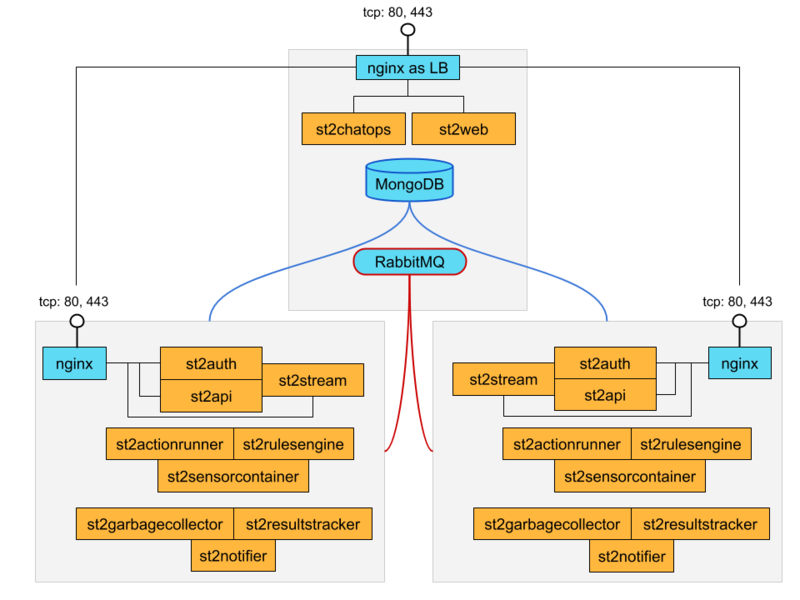 Multiple st2actionrunner processes can run in active-active with only connections to MongoDB and RabbitMQ. Work gets naturally distributed across runners via RabbitMQ. Adding more st2actionrunner processes increases the ability of StackStorm to execute actions. By design it is a singleton process. Running multiple instances in active-active will not yield much benefit, but will not do any harm. The ideal configuration is active-passive but StackStorm itself does not provide the ability to run this in active-passive. Multiple mistral-api processes can run in an active-active configuration by using a load balancer to distribute at its front end. This is similar to st2api. In a typical single box deployment mistral-api is local to the box and StackStorm communicates via a direct HTTP connection. For HA setup we recommend putting mistral-api behind a load balancer and setting up StackStorm to communicate via the load balancer. mistral-server is the worker engine for mistral i.e. the process which actually manages executions. The StackStorm plugin to mistral (st2mistral) communicates back to the StackStorm API. This process needs access to PostgreSQL and RabbitMQ. Multiple mistral-server processes can run and co-ordinate work in an active-active configuration. In an HA deployment all communication with the StackStorm API must be via the configured load balancer. This section has some HA recommendations for the dependencies required by StackStorm components. This should serve as a guide only. The exact configuration will depend upon the site infrastructure. StackStorm uses this to cache Actions, Rules and Sensor metadata which already live in the filesystem. All the content should ideally be source-control managed, preferably in a git repository. StackStorm also stores operational data like ActionExecution, TriggerInstance etc. The Key-Value datastore contents are also maintained in MongoDB. MongoDB supports replica set high-availability, which we recommend to provide safe failover. See here for how to configure StackStorm to connect to MongoDB replica sets. Loss of connectivity to a MongoDB cluster will cause downtime for StackStorm. However, once a replica MongoDB is brought back it should be possible to bring StackStorm back to operational state by simply loading the content (through st2ctl reload --register-all and st2 key load. Easy access to old ActionExecutions will be lost but all the data of old ActionExecutions will still be available in audit logs. 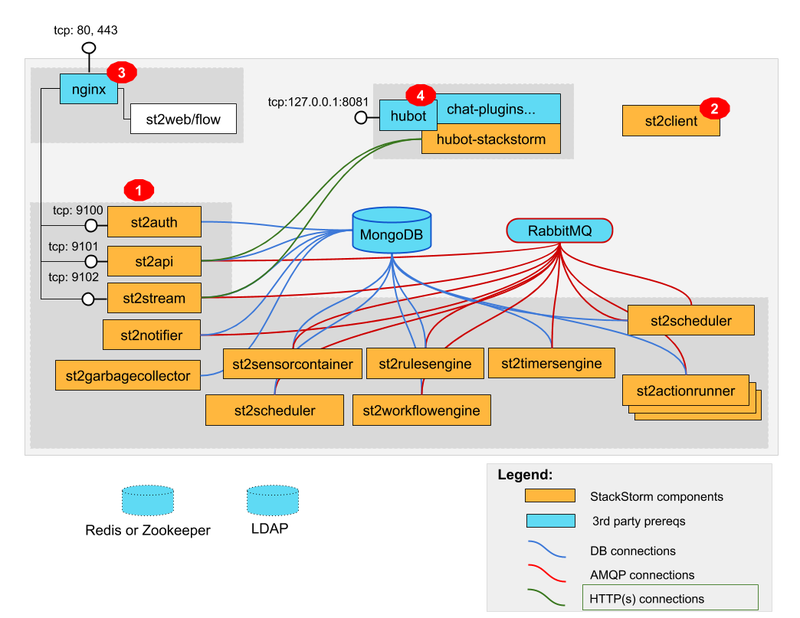 RabbitMQ is the communication hub for StackStorm to co-ordinate and distribute work. See RabbitMQ documentation to understand HA deployment strategies. See here for how to configure StackStorm to connect to a RabbitMQ cluster. Various StackStorm features rely on a proper co-ordination backend in a distributed deployment to work correctly. If the content folders i.e. /opt/stackstorm/packs and /opt/stackstorm/virtualenvs are placed on read-write NFS mounts then writes from any StackStorm node will be visible to other nodes. Special care needs to be taken with /opt/stackstorm/virtualenvs since that has symlinks to system libraries. If care is not taken to provision all host boxes in an identical manner it could lead to unpredictable behavior. Managing the virtualenvs on every host box individually would be a more robust approach. Manage pack installation using a configuration management tool of your choice, such as Ansible, Puppet, Chef, or Salt. Assuming that the list of packs to be deployed will be static, then deploying content to StackStorm nodes via CM tools could be a sub-step of an overall StackStorm deployment. This is perhaps the better of the two approaches to end up with a predictable HA deployment. In this section we provide a highly opinionated and therefore prescriptive approach to deploying StackStorm in HA. This deployment has 3 independent boxes which we categorize as “controller box” and “blueprint box.” We’ll call these boxes st2-multi-node-cntl, st2-multi-node-1 and st2-multi-node-2. For the sake of reference we will be using Ubuntu 14.04 as the base OS. Obviously you can also use RedHat/CentOS. In practice MongoDB, PostgreSQL and RabbitMQ will usually be on standalone clusters managed outside of StackStorm. The two shared components (st2chatops and st2web) are placed here for the sake of convenience. They could be placed anywhere with the right configuration. This box is a repeatable StackStorm image that is essentially the single-box reference deployment with a few changes. The aim is to deploy as many of these boxes for desired HA objectives and horizontal scaling. StackStorm processes outlined above can be turned on/off individually, therefore each box can also be made to offer different services. Configure users & authentication as per this documentation. Make sure that user configuration on all boxes running st2auth is identical. This ensures consistent authentication from the entire StackStorm install since the request to authenticate a user can be forwarded by the load balancer to any of the st2auth processes.